The Boston Public Library is currently featuring an exhibit on Boston's Forgotten Literary History. On a recent trip there, I ordered New England clam chowder, which my sever pronounced, "chowda," and placed in front of me with a bottle of tobasco sauce. He must have seen the confused look on my face, because in answer to my unasked question, he said, "Try it. 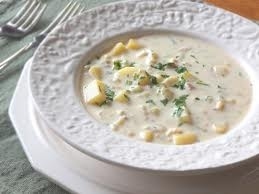 It's the real way to eat chowda, and you'll love it." So I did. The combination of the smooth creaminess of the chowder, and the sharp kick of tobasco made it surprisingly delicious. And I really don't know why it came as a surprise, because you add tobasco to raw clams and oysters on the half-shell before swallowing them, and they're yummy. So I highly recommend trying this culinary twist and visiting the beautiful Boston Public Library (although, of course, I'm partial to the New York Public Library). Fifty years ago yesterday, the Rolling Stones played their first gig in London. In the video below, Keith Richards discusses the bleak time in post-WWII England. It would make an interesting curriculm tie-in to have students explore the social and political changes experienced during the Stones' reign as a rock band. Since we've already discussed that music and lyrics are text, students could analyze the music as a reflection of the times. Enjoy the video.